Like getting a seat at Soul Cycle or snagging the last dress in your size at a sample sale, brunch is a veritable bloodsport in New York City. The battle for a table to eat huevos rancheros and drink bottomless mimosas while recounting your weekend’s misdoings with friends is a weekend tradition. Cut to Paris where Sundays are a lazy day when most shops and restaurants are closed. The typical French breakfast is a basket of pastries, a glass of juice and a cup of coffee, but thanks to globalization—or maybe it’s the mouthwatering waffle posts on IG—American- and Australian-style brunches have become a thing here. Whether you’re in the mood for savory eggs and bacon, photogenic avocado toast, or light and healthy fare, the 9 Best Brunch Spots in Paris have it all. Bonus: For those not fluent in French, many of these places are Anglophone-friendly! Ellsworth is the second, more laid-back restaurant from the owners of Verjus. Just because the atmosphere is more casual doesn’t mean the dishes aren’t treated with the same care. 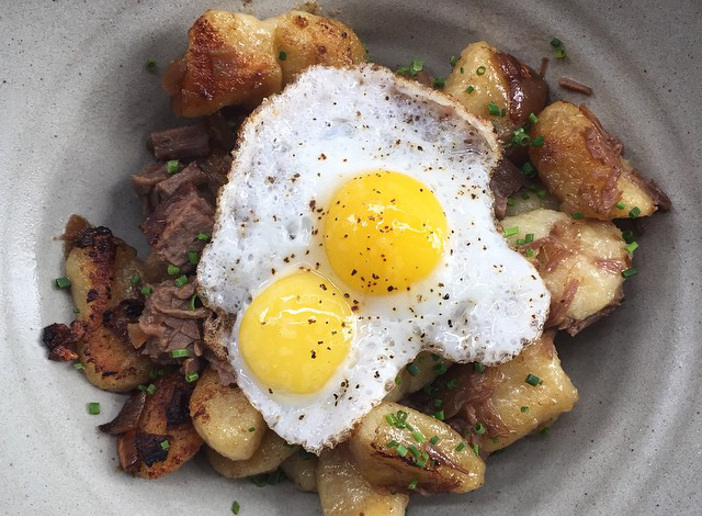 While Ellsworth is a popular dinner spot, their brunch menu deserves props. To get the most out of Ellsworth, order a variety of small plates meant for sharing. If you’re a fan of the fried chicken at Verjus, it’s also on the brunch menu here. The waffle or pancake is always a hit with its seasonal toppings. For single diners or couples, grab a seat at the bar if you didn’t remember to make a reservation. Go zen in this airy and soothing cafe decorated with neutral tones. Umami Matcha Cafe recently launched a new series of brunch sets, including a vegetarian option. It’s matcha heaven for lovers of the earthy, slightly bitter flavor. Brunch has a Japanese spin with matcha pancakes and yuzu syrup, poached eggs with black sesame oil sauce, and quinoa with courgette and miso. If you’d like to recreate the flavors at home, there’s a small epicerie selling sauces, soups, tea, and other items from Japan. Don’t forget to order your choice of accompanying matcha drink, such as a matcha frappe, matcha milkshake, or matcha latte. Come hungry to Rachel’s, where the platters easily take up half the table. Located in the Haut Marais and serving hearty, homestyle dishes like fried buttermilk chicken and yes, huevos rancheros. If you can’t decide what to order, there’s the popular “All-American brunch platter”: eggs, homemade yogurt and granola, salad, home fries, pancakes, and a choice of sausage, bacon, or smoked salmon. In addition to the the ground floor, there’s a seating section upstairs. And don’t miss the freshly baked goods. Founder Rachel supplied respected restaurants all around Paris with her signature cheesecakes, bagels, and muffins before opening her own restaurant. Eggs en cocotte at Eggs & Co.
Tucked away on a small street in Saint Germain-des-Pres, Eggs & Co. is easy to spot with its black exterior and bold white lettering. Head upstairs to savor brunch in a traditional farmhouse setting. 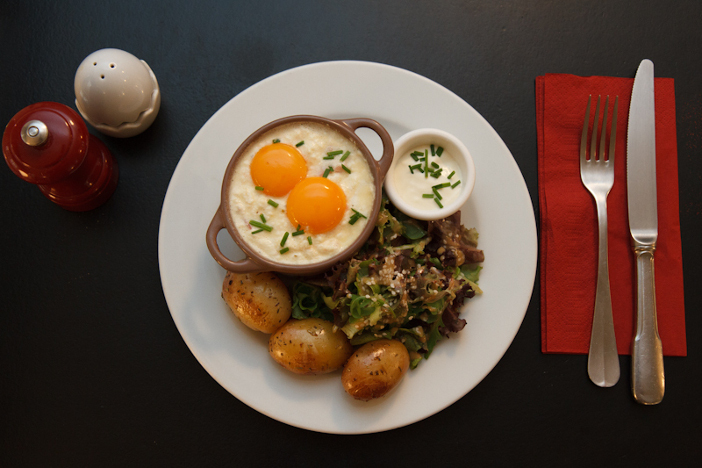 Enjoy a French take on eggs, like eggs en cocotte (cooked in its own cast-iron pot) or a soft boiled egg with slices of toast for dipping into the runny yolk. The set brunch comes with eggs, potatoes, salad, a coffee or tea, and a glass of orange juice. Choose your eggs then customize with a wide selection of toppings such as cheeses, vegetables, and fresh herbs. Save room because the final course of the set brunch is a voluminous pancake served with fresh fruit. Eggs of your choice with a selection of sides are served all day long, with a rotating menu for breakfast and lunch. During truffle season, you have the delectable option to order eggs with shaved truffles. Our favorite selection of sides to accompany the eggs? The crispy hash browns and baked beans in a rich tomato sauce. The butter from Poitou-Charentes is to die for. Also, serves some of the best coffee in Paris! Dining at La Chambre Aux Oiseaux makes you feel like you’re in your (French) grandmother’s living room with its mismatched oversized furniture, floral patterned wallpaper, and porcelain dishes. The weekend vibe is bustling at this restaurant near the Canal St. Martin. The set brunch includes a selection of breads, fresh juice, hot drink, boiled egg, salad, cheese, charcuterie, soup, and a rotating hot dish. If there isn’t a jar of their signature homemade carrot vanilla almond jam on the table, ask for it! You won’t be disappointed. For a smaller appetite, there’s also a choice of small brunch dishes. Manhattan brunches are as much about the cocktails as they are the food: mimosas, bellinis and of course, Bloody Marys. In Paris, Bespoke is the real deal: an artisanal cocktail bar by night with a ridiculously delicious brunch menu. They’ve got fried chicken and waffles, avocado toast, pulled pork pancakes with bacon, and a much-Instagrammed fresh fruit waffle. That’s enough to make them one of the 9 best brunch spots in Paris, but their Bloody Mary may be the best we’ve ever had, anywhere. LES LOLOS Tip: Our Martini Editor, Forest Collins, snagged their Bloody Mary recipe so you can make it at home. Check it out here! There’s more than meets the eye at Cafe Oberkampf. In addition to great coffee, it also serves a mean brunch until 3pm and everything on the small menu is a hit. If you’re looking for some of the best avocado toast in Paris, you’ve found it. 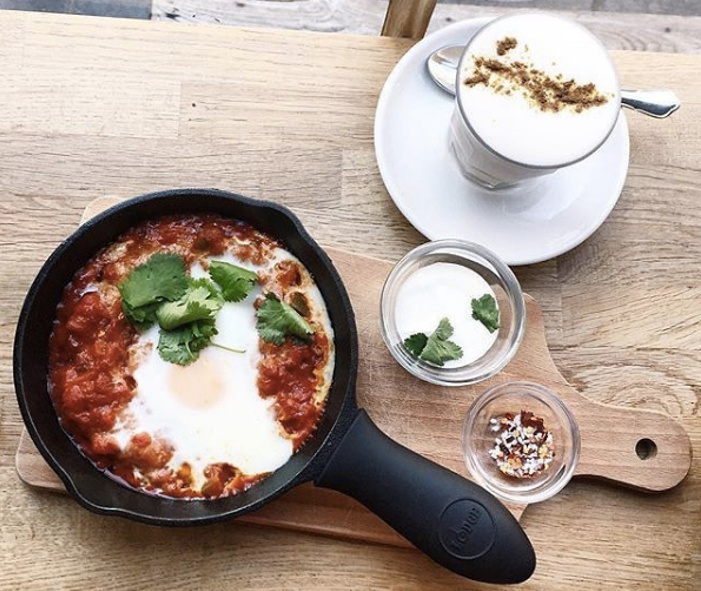 Other favorites include the shakshuka, an egg cooked in tomato sauce with onions and spices (add Feta cheese for extra oomph). The “Lost in Cheeseland” (named after It blogger Lindsey Tramuta) is a grilled cheese sandwich served with carrots. The small, quiet cafe has limited seating so it’s best for small parties. Hardware Societe is a quaint and charming cafe definitely worth the hike to Montmartre. Hailing from Melbourne, their all-day brunch menu—as well as a selection of other plates—has something for everyone. For egg lovers, try the scrambled eggs, eggs benedict, or oeufs cocotte. For those in a savory mood, there’s pork belly, sausage, bacon, and salmon. Top it off with something sweet like the amazing pain perdu (French toast). 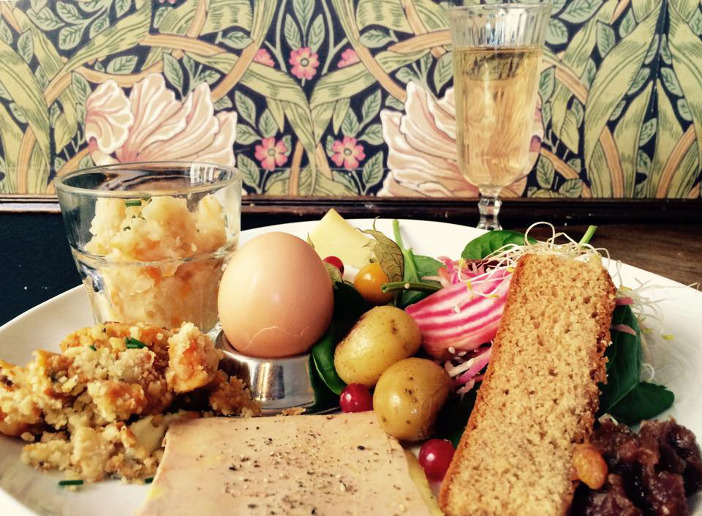 Hardware Societe is a welcome addition to the 9 best brunch spots in Paris. Did we miss any best brunch spots in Paris to make this a Top 10? Let us know in the comments or on Facebook, Instagram and Twitter. 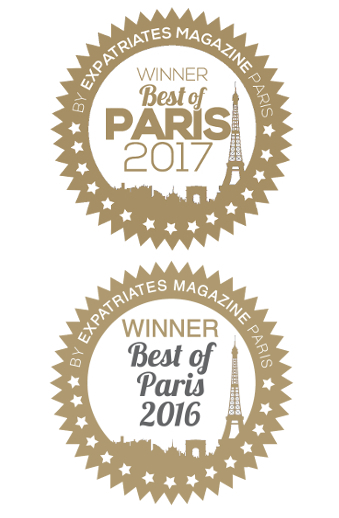 And sign up for our newsletter for all the best places to eat, drink and be merry in Paris.